The Hellenic Arms Control Center has founded the Hellenic Civil Guard which is composed mainly of civilian volunteers who do occasional patrols (by car or on foot). They go through basic training and they are practically always on duty. According to the Greek Law they may apprehend a suspected person or even make an arrest if necessary (e.g. when a crime is committed – a constitutional right of every law-abiding citizen). Its members are trained to provide the initial response to a security situation until the police arrive. 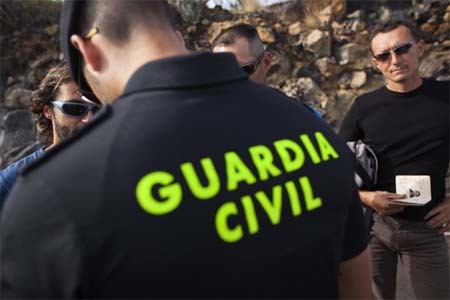 The Hellenic Civil Guard will prove to be particularly effective in cases of national emergencies (such as criminal activities during insurrections, foreign invasions etc) and in handling national disasters (fires, storms, earthquakes etc). Hellenic Civil Guards are subject to the Greek Laws and constitution while details about their structure and command will be announced in time. This patriotic body of volunteers may hopefully provide some employment to the Greek professional soldiers who are made redundant due to the financial situation in Greece. The Hellenic Civil Guard members are not armed but they are uniformed and they carry all the available equipment to exercise their rights in upholding the law. More details about its command, structure, personnel, uniform etc will follow in time. Το άρθρο δημοσιεύτηκε Τρίτη, Φεβρουάριος 7th, 2012 στις 03:21 στην κατηγορία ΣΩΜΑΤΑ ΑΣΦΑΛΕΙΑΣ. Μπορείς να παρακολουθείς τα σχόλια χρησιμοποιώντας το RSS 2.0 feed. Σχόλια και pings δεν επιτρέπονται.